The Pentek CC-10 water filters produce healthier, better-tasting drinking water. 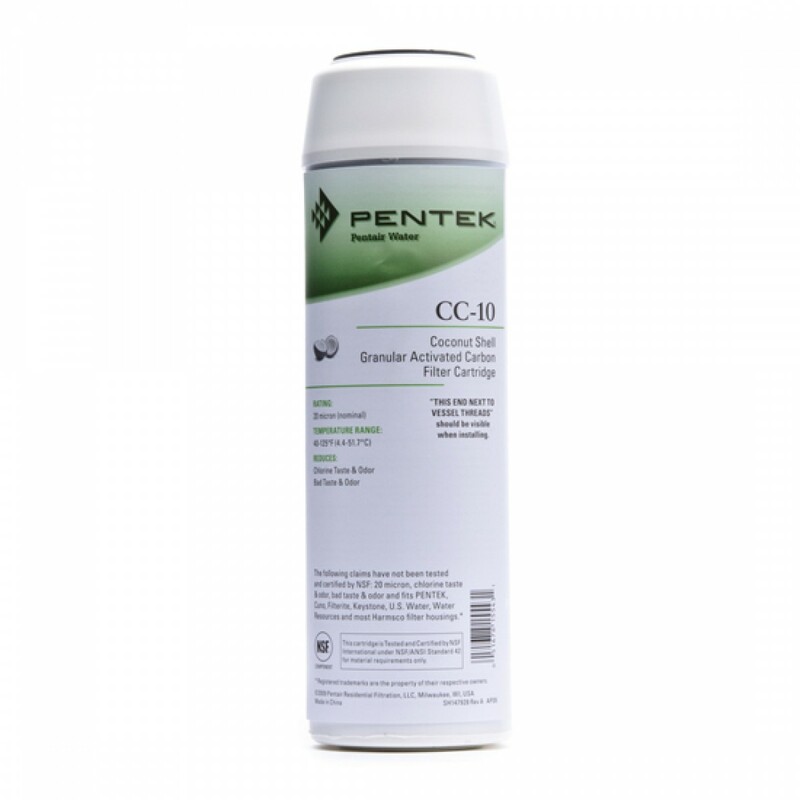 The Pentek CC-10 replacement filters have effective bad taste & odor and chlorine taste & odor reduction (based on manufacturer's internal testing). The Pentek CC-10 filter cartridge has greater VOC reduction than standard GAC cartridges (based on manufacturer's internal testing). 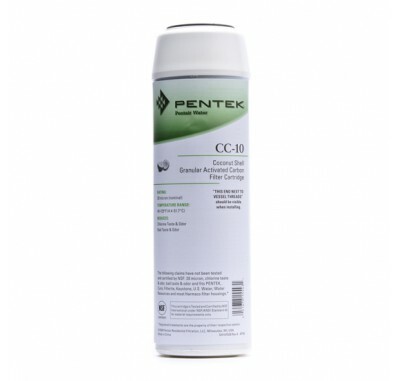 The Pentek CC-10 water filters have a postfilter to reduce carbon fines. The Ametek CC-10 water filter cartridge also reduces MTBE. The Pentek CC-10 filter cartridges contain coconut shell-based activated carbon, which produces drinking water of exceptional taste and quality and provides better VOC reduction than standard GAC cartridges (based on manufacturer's internal testing). Before the water exits the Pentek CC-10 cartridge, a postfilter helps remove carbon fines and other suspended particles from the filtered water. The postfilter is permanently fastened to an innovative support basket ensuring that it is firmly secured, eliminating any potential for bypass. NOTE: Internal testing of the CC-10 at 0.6 gpm (2.3 L/min) has shown an average of 92% reduction of 18.9 ppb MTBE through 750 gallons (2840 L), and an average of 98% reduction of 300 ppb Chloroform (VOC surrogate chemical) through 425 gallons (1605 L). NOTE: CC-10 cartridge performance and capacity may vary depending on water conditions and testing variables. NOTE: A drinking water cartridge may contain carbon fines (very fine black powder). After installation and before using the water, follow the instructions for flushing the cartridge to remove fines. It is recommended that you run the tap for 20 seconds prior to using the water for drinking or cooking purposes. NOTE: Do not use with water that is microbiologically unsafe or of unknown quality without adequate disinfection before or after the system. Nominal 20 micron Pentek CC-10 Coconut Shell Granular Activated Carbon Water Filter Cartridge. 155155 Pentek CC-10 filter fits in housings for 10 inch water filters.